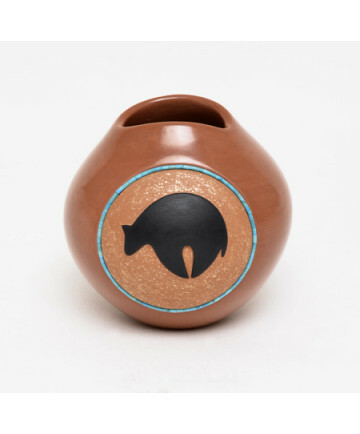 Pottery Bear Bowl with Turquoise Inlay by Dora Tse-Pe (San Ildefonso) Dora Tse-Pe is of the Tewa tribe and was born at Zia Pueblo in 1939. 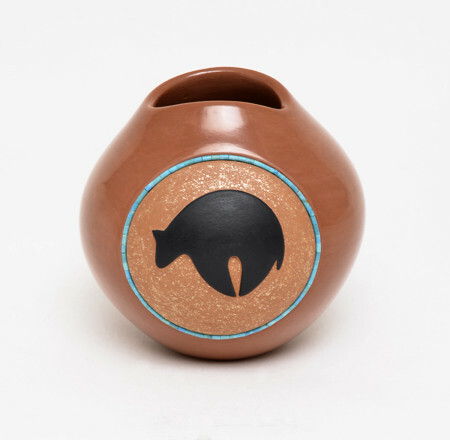 She moved to San Ildefonso Pueblo when she married, already knowing how to make pottery, but her mature style was influenced by her mother-in-law Rose Gonzalez, who she watched make red and black pots. She learned to polish the clay at San Ildefonso as well. Dora says she was also inspired by Maria Martinez's son Popovi Da and his son Tony Da. This pot measures 4 1/2 inches tall by 15 1/8 inches in circumference. Approximate diameter measures 4 1/2 inches.